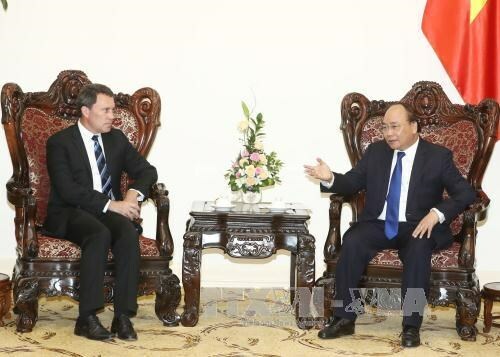 Hanoi (VNA) – The Government of Vietnam will create favourable conditions for the US oil and gas group ExxonMobil to successfully implement cooperation programmes and projects in Vietnam, Prime Minister Nguyen Xuan Phuc has said. During a reception in Hanoi on August 29 for Jon Gibbs, ExxonMobil Vice President of Asia Pacific and Middle East, PM Phuc applauded investment projects of ExxonMobil in Vietnam, particularly cooperation projects with the Vietnam National Oil and Gas Group (PetroVietnam). For his part, Gibbs expressed his hope that the PM and the Government of Vietnam will facilitate the group’s cooperation projects with PetroVietnam so that they could be soon implemented, benefiting both sides. He also suggested the Vietnamese Government support its projects to build power plants in Vietnam in order to shorten the implementation time. PM Phuc said the Government has approved the planning scheme for the Gas Treatment and Power Centre in the central region, including projects in Quang Nam and Quang Ngai provinces, in which environmental protection and welfare of the people are the biggest requirements. He also urged ExxonMobil to continue working closely with the Electricity of Vietnam (EVN) Group, PetroVietnam and the Ministry of Industry and Trade to ensure the progress of the projects.